Although it is another supernatural romance for the young adult market, Shatter Me by Tahereh Mafi actually has a great concept of a dark and dystopian world, in a similar vein as Tomorrow When the War Began by John Marsden and recent success story The Hunger Games trilogy by Suzanne Collins. Shatter Me deals with the lonely and disturbed Juliette, abandoned by her parents and shunned by the world, left to rot in a prison for so-called ‘freaks.’ The Reestablishment has destroyed life and civilisation as we know it. She possesses the power to kill through touch alone, which captures the attention of the enemy, but Juliette is desperate to fight to feel human once more. When she finds solace in soldier Adam, a face from her past, they both share the same need for humanity and a quiet, mutual love for one another. Together, they soon escape… This is when the battle truly begins. Mafi’s writing style applies a great device in using a stream of consciousness for Juliette’s observations, and provides a sense of disjointedness. However, the constant repetition and fragmentation of sentences can pull you out of the action and careen off-track. Some metaphors and similes used also feel out of place and awkward. It also makes you think how a girl so tortured by such a cold and bleak universe can afford to describe her surroundings and thoughts so coherently and eloquently, especially when written in the first person. It just doesn’t fit the world she is supposed to be apart of, nor sound like the kind of language a 17 year old girl would use. There also doesn’t feel like much of a build-up to Juliette and Adam’s romance, he conveniently reappearing in her life in prison despite the past they share. Even though Juliette tries to convince us of her deep feelings for Adam, they don’t ever seem to go anywhere beyond she always commenting on how ‘gorgeous’ he is or other superfluous adjectives. The romantic sentiments and flowery prose Juliette uses when describing Adam and her love for him can be over the top against the backdrop of a wasteland, causing a mood whiplash in amongst the fear and danger we’re supposed to feel. Juliette never even bothers to question why he’s even apart of The Reestablishment in the first place if he’s so against their regime or how he got there. However, it could be argued that Mafi’s rambling prose adds a certain frantic and crazy train of thought to Juliette, and makes you wonder about her true state of mind in amongst this hell on Earth. When deconstructed, just how far out of control has Juliette’s mind gone and can we trust her point of view? The film rights to Shatter Me have already been obtained by 20th Century Fox, yet it might be a little difficult to adapt this story as it is a slow burner and takes time for the action to truly develop. Shatter Me is a promising story of humanity lost, and can be quite a heavy read. Hopefully, more information will be given about this frightening world Mafi has constructed and just who The Reestablishment are and came to be throughout the rest of her proposed trilogy, as it does serve to provide much interest. Shatter Me is one of those books that I couldn’t wait to read. Not only has it been incredibly hyped online, but it has an incredibly compelling concept and a great blurb that screams “Read me!” Being touted as the Hunger Games meets X-men, Shatter Me boasted some of the most unique marketing I’ve ever seen for a YA novel, despite its unknown author and not-incredibly-compelling cover. Being the dystopian nerd that I am, I was completely pulled in by the incredible blurb and was beyond exciting for this title. Shatter Me was strangely difficult for me to get into.. Firstly, Juliette spends much of the first half of the novel being completely obedient to the horrible regime that locked her away and seemed completely resigned to her terrible fate. It also doesn’t help that she spends far too much time feeling sorry for herself, calling herself a “monster” and dripping with angst. There were times I wanted to tell her to just get over it. Thankfully, throughout the novel Juliette’s adventures help to meld her into a stronger, better person who is more confident and empowered. I’ve also read some interesting reviews that have discussed how much they loved the writing style in Shatter Me. I’m not sure I like it -in fact, I was torn for much of the book. Most of the writing is done in stream-of-conscious style that really gets into Juliette’s head, but left me out of breath by the end of most sentences. It didn’t seem that polished or crisp to me. Again, this did get better as the book went on, but I wouldn’t rave about the writing style here. However, some sentences here were amazing emotional gems that really were beautiful. 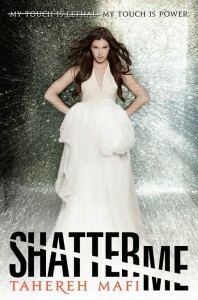 I wouldn’t call Shatter Me the best dystopian novel I’ve read this year, but it’s still worth reading. It’s certainly something different in the genre with a unique style approach that’s unlike anything else I’ve ever read. Recommended for fans of dystopian romance. This entry was posted in Books and tagged book review, books, fiction, shatter me, tahereh mafi, young adult. Bookmark the permalink.